cDepartment of Medical Imaging (C.O.A.T., W.B., T.K. ), Toronto Western Hospital, Toronto, Ontario, CanadaeDepartment of Radiology (W.B., D.F.K. ), Mayo Clinic, Rochester, Minnesota. eDepartment of Radiology (W.B., D.F.K. ), Mayo Clinic, Rochester, Minnesota. BACKGROUND: There is ongoing debate regarding the optimal first-line thrombectomy technique for large-vessel occlusion. PURPOSE: We performed a systematic review and meta-analysis of comparative studies on stent retriever–first and aspiration-first thrombectomy. DATA SOURCES: We searched Ovid MEDLINE, PubMed, and EMBASE from 2009 to February 2018. STUDY SELECTION: Two reviewers independently selected the studies. The primary end point was successful reperfusion (TICI 2b/3). DATA ANALYSIS: Random-effects meta-analysis was used for analysis. DATA SYNTHESIS: Eighteen studies including 2893 patients were included. There was no significant difference in the rate of final successful reperfusion (83.9% versus 83.3%; OR = 0.87; 95% CI, 0.62%–1.27%) or good functional outcome (mRS 0–2) at 90 days (OR = 1.07; 95% CI, 0.80–1.44) between the stent-retriever thrombectomy and aspiration groups. The stent-retriever thrombectomy–first group achieved a statistically significant higher TICI 2b/3 rate after the first-line device than the aspiration-first group (74.9% versus 66.4%; OR = 1.53; 95% CI, 1.14%–2.05%) and resulted in lower use of a rescue device (19.9% versus 32.5%; OR = 0.36; 95% CI, 0.14%–0.90%). The aspiration-first approach resulted in a statistically shorter groin-to-reperfusion time (weighted mean difference, 7.15 minutes; 95% CI, 1.63–12.67 minutes). There was no difference in the number of passes, symptomatic intracerebral hemorrhage, vessel dissection or perforation, and mortality between groups. LIMITATIONS: Most of the included studies were nonrandomized. There was significant heterogeneity in some of the outcome variables. CONCLUSIONS: Stent-retriever thrombectomy–first and aspiration-first thrombectomy were associated with comparable final reperfusion rates and functional outcome. Stent-retriever thrombectomy was superior in achieving reperfusion as a stand-alone first-line technique, with lower use of rescue devices but a longer groin-to-reperfusion time. Endovascular thrombectomy is recommended as a standard of care for anterior circulation acute ischemic stroke secondary to large-vessel occlusion.1 This treatment was established in 2015 when multiple randomized controlled trials (RCTs) established the clinical efficacy and safety of modern stent-retriever thrombectomy (SRT) in removing the obstructing thrombus in acute ischemia.2⇓⇓⇓–6 A Direct Aspiration, First Pass Technique for the Endovascular Treatment of Stroke (ADAPT) is an alternative thrombectomy technique that has become the standard of care at many centers.7 This is performed by advancing a large-bore catheter (typically with an inner diameter of ≥0.060 inch) to the face of the thrombus, followed by its removal by aspiration alone or withdrawal of the catheter while aspirating. Previous observational studies focusing on ADAPT reported a higher rate of complete revascularization and potentially a shorter time from groin puncture to reperfusion compared with stent-retriever thrombectomy.8 However, recent randomized trials comparing SRT with ADAPT have failed to demonstrate the superiority of ADAPT in technical or clinical outcomes.9 To address the ongoing debate of the optimal first-line thrombectomy technique, we performed a meta-analysis of comparative studies reporting outcomes on SRT versus ADAPT as a first-line approach. A systematic literature review was performed following the Preferred Reporting Items for Systematic Reviews and Meta-Analyses (PRISMA) guidelines.10 The English literature was searched with Ovid MEDLINE, PubMed, and EMBASE from January 2009 to February 2018. The following terms and their combinations were used as keywords or Medical Subject Headings terms: “mechanical thrombectomy,” “endovascular,” “stroke,” “ADAPT,” “aspiration,” “stent retriever,” and “first-pass.” We also searched the references of relevant articles and contacted experts in the field to identify additional studies pertaining to the outcome of different thrombectomy techniques that were not included in the initial literature search. Studies identified were then evaluated to meet the following inclusion criteria: 1) studies comparing the outcomes of the SRT-first and aspiration-first strategies; 2) studies reporting separately the clinical and technical outcomes of the SRT and aspiration groups; and 3) studies with at least 10 patients each in the SRT or aspiration group. The exclusion criteria were the following: 1) noncomparative studies reporting outcomes only on 1 group (SRT or aspiration); 2) studies that predominantly used the first generation of aspiration catheters (eg, Penumbra Separator 0.041 [Penumbra, Alameda, California] or smaller catheters, with or without the Separator) in the aspiration arm; and 3) studies that did not separate outcomes by the first-line thrombectomy technique adopted. Both randomized and observational studies were included. Patients were divided into 2 groups: SRT-first and aspiration-first. For this study, patients were considered to have SRT-first if any stent retriever was used in the first thrombectomy attempt, with or without balloon-guiding catheters or simultaneous distal aspiration (ie, Solumbra technique). Those receiving only direct aspiration with large-bore distal-access catheters in the first thrombectomy attempt were considered aspiration-first. The primary end point was the rate of successful reperfusion defined as the final Thrombolysis in Cerebral Infarction score of 2b/3. Other clinical outcomes included the following: good functional outcome defined as a modified Rankin Scale 0–2 at 90 days, 90-day mortality, symptomatic intracererbal hemorrhage, and complications of vessel dissection or perforation. Other technical outcomes studied included the following: the rate of complete reperfusion (TICI 3), the rate of TICI 2b/3 achieved with only the first device, the use of a rescue device, the number of thrombectomy passes, and the time from groin puncture to reperfusion. The included studies were assessed for risk of bias by 2 independent readers (A.C.O.T. and I.H.W.C.) with the Newcastle Ottawa Scale.11 This is an 8-item tool for nonrandomized studies included in systematic reviews and meta-analyses, in which the selection, comparability, and ascertainment of outcomes of the study groups are assessed. The scale ranges from 0 to 9, with the higher score indicating lower risk of bias. Studies that used well-defined selection criteria, with comparable baseline stroke severity; patient demographics; onset-to-groin puncture time, with contemporaneous use of SRT; and aspiration thrombectomy and those that had an independent assessment of clinical and technical outcomes are considered to have a low risk of bias. We extracted from each study a 2 × 2 table for binary outcomes and the mean group sample size and a variability measure for continuous outcomes. The pooled outcomes were meta-analyzed using a random-effects model.12 Heterogeneity of the studies not attributable to chance was quantified with the I2 statistic.13 The 95% confidence intervals of the odds ratios for binary outcomes and the weighted mean differences for continuous outcomes were reported. Some included studies reported continuous outcomes with median and interquartile range; these were converted to a mean and SD value based on the assumption of a log-normal distribution of the original measure. When the SD or the interquartile range for a specific outcome was not reported in the article, it was extrapolated from other studies when such data were available. If >10 studies were identified, a funnel plot was constructed to explore the impact of publication bias. The initial literature search yielded 862 articles. The titles and abstracts of these were read, and 818 articles were excluded for irrelevance. Of the remaining 44 articles, 14 were excluded because they were conference abstracts, and 7 were excluded because they were review articles or editorials. After review, 2 articles were excluded for overlapping patient populations, and 4 studies were excluded for predominantly using a previous generation of thrombectomy devices. One additional study was identified by contacting experts in the field, yielding a total of 18 studies eligible for analysis.9,15⇓⇓⇓⇓⇓⇓⇓⇓⇓⇓⇓⇓⇓⇓⇓–31 The PRISMA flow diagram is provided in Fig 1. A total of 2893 patients (1564 with SRT and 1329 with aspiration-first) in the 3 randomized multicenter trials and 15 retrospective studies were included. The mean age of patients in the SRT and aspiration group were 69.8 and 68.7 years, respectively. For the SRT group, the mean baseline NIHSS score was 15.8, and that in the aspiration group was 15.3. The median ASPECTS in both groups was 8. Balloon-guiding catheters were routinely used in 5 studies, intermittently used in 2 studies, and not used in 11 studies. In 6 studies, simultaneous adjuvant distal aspiration with SRT was used in the first pass in a variable proportion of patients. All except 3 studies reported predominantly anterior circulation thrombectomy (>85%), including the 3 randomized trials. There were 4 retrospective single-center studies reporting only posterior circulation thrombectomy, comprising 138 patients (8.8%) in the SRT arm and 126 patients (9.5%) in the aspiration arm. Four studies had a low risk of bias, 12 had a moderate risk of bias, and 2 had a high risk of bias. The included studies are summarized in Table 1. When we compared SRT-first and aspiration-first thrombectomy, there was no statistically significant difference in the rate of final successful reperfusion (TICI 2b/3) (83.9% versus 83.3%; OR = 0.87; 95% CI, 0.62%–1.27%) or complete reperfusion (TICI 3) (38.1% versus 40.3%; OR = 0.82; 95% CI, 0.49%–1.37%). The SRT-first group achieved a statistically significant higher TICI 2b/3 rate after the first-line strategy than the aspiration-first group (74.9% versus 66.4%; OR = 1.53; 95% CI, 1.14%–2.05%) and this resulted in lower use of the rescue device (19.9% versus 32.5%; OR = 0.36; 95% CI, 0.14%–0.90%) (Fig 2). The aspiration-first approach resulted in a statistically shorter groin-to-reperfusion time (weighted mean difference, 7.15 minutes; 95% CI, 1.63–12.67). There was no difference in the number of passes required to achieve reperfusion between groups. Forest plot of meta-analysis results. A, Final successful reperfusion was TICI 2b/3. B, Good functional outcome mRS 0–2 at 90 days. Successful reperfusion TICI 2b/3 after the first-line approach (C) and the use of a rescue device (D). There was no statistical difference in the rate of good functional outcome (mRS 0–2) at 90 days between groups (OR = 1.07; 95% CI, 0.80–1.44). There was also no significant difference in the mortality rate, the rate of symptomatic intracerebral hemorrhage, emboli to new territories, vessel dissection, or perforation between the 2 groups. These results are summarized in Tables 2 and 3. 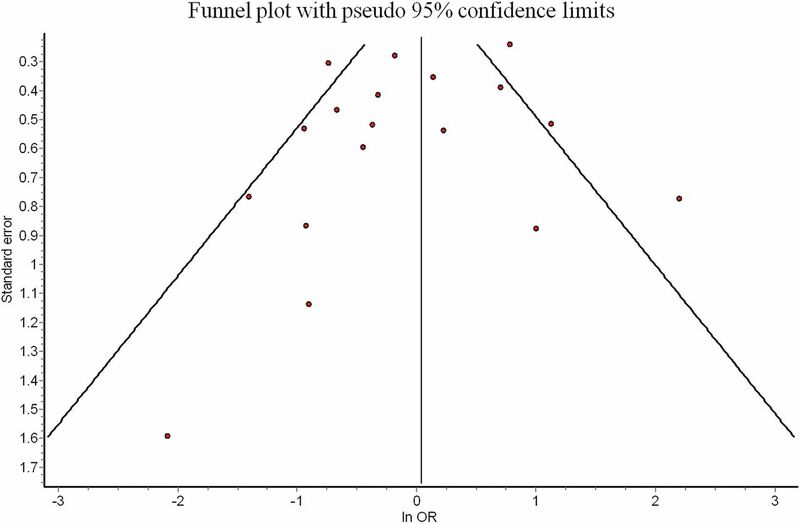 Funnel plot analysis did not suggest publication bias (Fig 3). There was low heterogeneity (I2 < 50%) for the following outcomes: the TICI 2b/3 rate after the first-line approach (I2 = 31%), mortality rate (I2 = 28%), risk of symptomatic intracerebral hemorrhage (I2 = 0%), emboli to new territories (I2 = 0%), and vessel dissection or perforation (I2 = 26%). There was moderate substantial heterogeneity (I2 >50%) for the following outcomes: final rate of TICI 2b/3 (I2 = 54%), final rate of TICI 3 (I2 = 79.5%), mRS 0–2 at 90 days (I2 = 62%), the need for a rescue device (I2 = 93%), groin-to-reperfusion time (I2 = 79%), and the number of passes required (I2 = 77%). Meta-regression analyses performed on outcomes with high heterogeneity (final TICI 2b/3 and mRS 0–2 at 90 days) did not identify variables explaining differences between studies. We performed a subgroup analysis to determine whether the outcomes were different in anterior circulation stroke versus posterior circulation stroke. In the 9 studies that included predominantly (>90%) anterior circulation stroke, there was no statistically significant difference in the final TICI 2b/3 rate between groups (OR = 0.892; 95% CI, 0.59–1.35). Four studies reporting posterior circulation stroke only were included. The use of the SRT-first approach in posterior circulation stroke was associated with a statistically significant lower successful reperfusion (OR = 0.47; 95% CI, 0.25–0.91). When we included only the 3 randomized controlled trials, we found no difference in the final TICI 2b/3 rate (OR = 1.05; 95% CI, 0.58–1.90) and good functional outcome (OR = 1.04; 95% CI, 0.79–1.37). There was a non-statistically significant higher chance in the SRT-first group of achieving TICI 2b/3 after the first-line approach (OR = 1.26; 95% CI, 0.85–1.86). When including only the 5 studies that consistently used balloon-guiding catheters with SRT, we again found no difference in the final TICI 2b/3 rate (OR = 0.95; 95% CI, 0.54–1.67) and good functional outcome (OR = 1.22; 95% CI, 0.91–1.64). There was a non-statistically significant higher chance in the SRT-first group of achieving TICI 2b/3 after the first-line approach (OR = 1.26; 95% CI, 0.92–1.73). When we excluded the study that used the Penumbra 3D Separator device,28 which was different in design from other conventional stent retrievers, there were no differences in the final TICI 2b/3 rate (OR = 0.88; 95% CI, 0.62–1.25). When we included only the 3 studies that reported TICI 2c/3 outcomes, there were no differences in the final TICI 2c/3 rate (OR = 1.10; 95% CI, 0.61–1.89) between groups. Our meta-analysis of 2893 patients from 18 studies found no significant difference in terms of the final revascularization rate and functional outcome between aspiration-first and SRT-first thrombectomy for large-vessel occlusion stroke. Notably, stent retriever use was superior in achieving successful reperfusion as a stand-alone technique, compared with aspiration. The need for a rescue device was also significantly less when SRT was adopted as a first approach instead of aspiration. The comparable final reperfusion rate in the aspiration group was achieved with the use of a rescue device after the initial failed attempts with contact aspiration, which was necessary in 32.5% of patients. These findings are important because they suggest that despite SRT and aspiration-first strategies being able to achieve similar final revascularization rates and functional outcomes, SRT appears to be more effective than aspiration as a primary treatment technique for achieving TICI 2b/3 revascularization. Endovascular thrombectomy with stent retrievers for large-vessel occlusion stroke has been established as the standard of care since 2015.32 The use of direct-contact aspiration thrombectomy is another common technique but was not supported by class I evidence. Nevertheless, aspiration thrombectomy as a first-line approach is widely practiced in the United States, Hong Kong, and Italy despite the availability of the proved and efficacious stent-retriever thrombectomy.33⇓–35 The THERAPY (The Randomized, Concurrent Controlled Trial to Assess the Penumbra System's Safety and Effectiveness in the Treatment of Acute Stroke; NCT01429350) trial, which compared aspiration thrombectomy with best medical therapy, was halted early and did not demonstrate efficacy.36 While recent meta-analyses of uncontrolled observational studies focusing solely on the aspiration technique reported higher complete reperfusion rates and shorter procedure times than SRT,8,37 these conclusions were confounded by the different patient-selection criteria and baseline stroke severity in the included single-arm studies. 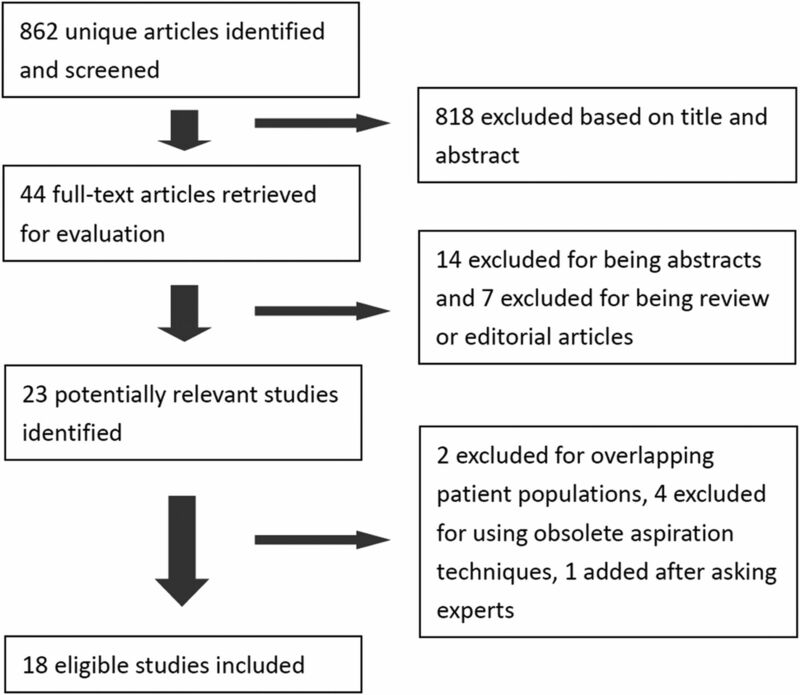 The published RCTs on this subject demonstrated noninferiority of aspiration thrombectomy compared with SRT in the final reperfusion rate but were underpowered to compare other clinical outcomes such as functional status and complication rates.8,37 To address these limitations, the present review included only studies that compared both SRT-first and aspiration-first approaches in the same patient cohort, as well as the 3 recently published/presented RCTs investigating these 2 groups. One of the notable findings from our study is that SRT could achieve higher rates of TICI 2b/3 reperfusion without the help of rescue therapy than aspiration thrombectomy alone. This is important because the literature has focused more on the first-pass effect during thrombectomy for acute ischemic stroke, defined as achieving complete recanalization with a single pass. In a recently published post hoc analysis of the North American Solitaire Acute Stroke Registry, Zaidat et al38 found that patients who achieved TICI 2b/3 on a first pass had significantly better clinical outcomes than those who did not. Independent predictors of a first-pass effect included the use of a balloon-guiding catheter and noninternal carotid artery terminus occlusion. While we were not able to examine first-pass recanalization rates between SRT and aspiration in this meta-analysis, SRT alone achieved higher recanalization rates than aspiration alone. Ultimately, the fact that SRT was used as a rescue therapy in nearly one-third of aspiration cases while aspiration was needed as rescue therapy in nearly one-fifth of SRT cases suggests that SRT has some technical advantages in clot retrieval. There are a number of advantages to aspiration thrombectomy compared with SRT. With contact aspiration thrombectomy, it is not necessary to traverse the occluding thrombus, thus theoretically reducing the risk of vessel perforation and downstream emboli. While cases of catastrophic vessel perforation with the use of SRT have been reported, the incidence was low.39 Our review did not show any significant difference in the safety profiles between the 2 groups. Rates of vessel perforation, dissection, and symptomatic ICH were comparable. Another proposed advantage of aspiration over SRT is the shorter procedural time. The aspiration-first approach was associated with a 7-minute advantage in groin-to-reperfusion time in the meta-analysis. In the 3 randomized studies comparing the 2 approaches, the aspiration-first approach also resulted in a shorter procedural time of 10–13 minutes.9,27,28 Nevertheless, this advantage in rapidity did not translate to improved patient outcome in any of those trials. While the overall final reperfusion rate is comparable, there remain uncertainties about whether SRT or aspiration is superior in selected vessel locations or the etiology of stroke. Subgroup analysis of the 4 posterior circulation stroke studies including 264 patients showed that SRT was inferior to aspiration in terms of reperfusion rates. However, the sample size was too small to draw any definitive conclusions. None of the included studies reported the comparative efficacy of aspiration and SRT stratified by the specific occluded vessel to allow subgroup analysis. The etiology of large-vessel occlusion may also affect the efficacy of thrombectomy. In large-vessel occlusion secondary to intracranial artery stenosis, early experience with stent retrievers in this group of patients resulted in a lower reperfusion rate and poorer outcome. In addition, rescue therapy with balloon angioplasty or intra-arterial thrombolytic infusion was frequently required.40 The shearing force exerted over the atherosclerotic plaque during stent retrieval may be the culprit, and the optimal first-line thrombectomy strategy in this group of patients needs further investigation. Techniques combining SRT and aspiration have been increasingly used, but their superiority over SRT or aspiration alone remains to be defined in randomized studies.17,41,42 Future studies on the optimal thrombectomy technique should also adopt more robust outcome variables, including TICI 2c/3 angiographic outcome and the first-pass success rate,38,43 and should consider other aspects such as delayed effects on the vessel wall and the relative cost-effectiveness of different techniques. Our study has limitations. Apart from the 3 RCTs, most of the included studies were nonrandomized, thus introducing selection bias. When performing subgroup analysis on only the 3 recent RCTs, we found results similar to those in our meta-analysis. We limited the review to comparative studies with control groups to compare the relative efficacy of SRT and aspiration and excluded those studies that used predominantly previous generations of thrombectomy catheters or devices. There was significant statistical heterogeneity in some of the outcome variables that can impact the validity of our results. Another limitation is that in some cases SRT was performed with simultaneous aspiration (ie, Solumbra technique) and we could not perform subgroup analyses of Solumbra versus SRT-alone versus aspiration. While TICI 2c/3 is increasingly recognized as a better angiographic outcome measure and correlates better with clinical outcome, only 3 of the included studies reported TICI 2c/3 rates and the subgroup analysis on these studies showed similar results. This systematic review and meta-analysis of 18 studies and 2893 patients found that SRT-first and aspiration-first thrombectomy were associated with comparable final reperfusion rates and functional outcomes. SRT was superior in achieving reperfusion as a stand-alone first-line technique, with lower use of rescue devices but a longer groin-to-reperfusion time. There were no significant differences in complication rates and mortality. The optimal first-line thrombectomy approach for specific location or stroke etiology remains unclear. Disclosures: Chun On Anderson Tsang—RELATED: Grant: Health and Medical Research Fund of Hong Kong (01150027), Comments: a peer-reviewed medical research grant provided by the Hong Kong government through the Food and Health Bureau. * David F. Kallmes—UNRELATED: Consultancy: Medtronic, Comments: clinical trials*; Grants/Grants Pending: Medtronic, Neuravi, Comments: preclinical and clinical research*; Patents (Planned, Pending or Issued): Mayo Clinic, Comments: balloon-guided devices; Stock/Stock Options: Marblehead Medical, Comments: stroke access device development. *Money paid to the institution. This study was supported by the Health and Medical Research Fund of Hong Kong (01150027).
. The Newcastle-Ottawa Scale (NOS) for assessing the quality of nonrandomised studies in meta-analyses. 2013. http://www.ohri.ca/programs/clinical_epidemiology/oxford.asp. Accessed February 6, 2018. Accepted after revision August 16, 2018.